You may think that it’s too late to get the flu shot this year, but you’re wrong. Although most people get the shot in the fall, you can get one well into spring. It’s best to be vaccinated against the influenza virus each year, even though there is plenty of misinformation out there about the shot and whether it’s even effective. Instead of catching a spring flu, why not protect yourself now and enjoy the warmer weather. When we talk about the flu, we aren’t talking about the common cold. The cold is considered a minor nuisance, typically treated with over-the-counter medicine. The flu, on the other hand, is not something to be ignored. The Centers for Disease Control and Prevention (CDC) estimate that flu-related deaths were as high as 56,000 during 2012-2013. Flu season in the United States generally lasts from October to May. People who get the flu are not dealing with a simple cold. The high fever, chills, body aches, sore throat, cough, and fatigue are all much more severe than those associated with a cold. An intense illness, the flu can knock you out for two weeks or more. According to the American Lung Association, more than 200,000 people are hospitalized in the United States due to the flu every year. It often causes complications like bacterial pneumonia, ear infections, and sinus infections. It can also lead to dangerous dehydration. Who Should be Protected Against the Flu? Many people think that if they are healthy, they don’t need to get a flu shot. The CDC disagrees. They advise that every person over six months old should get an annual flu shot. While the elderly are at greater risk of developing complications from the flu, there are other high-risk groups, as well. If you’re over 65 or are pregnant, you are also considered to be high-risk. Even if you don’t fall into one of these categories, if you live with someone who does, you should get the flu shot to help protect that person. While it is true that the flu shot will not protect you from every strain of the flu virus and may not work for every person, most doctors still recommend the shot to their patients – especially those who fall within a high-risk group. In general, the flu vaccine is effective in two-thirds of the people who get it. It is least effective in the elderly, which is why those who care for the elderly should be vaccinated. An older person’s best chance of not getting infected with the flu is if those around him do not get it. The flu vaccine itself will not make you sick. It is medically impossible to catch the flu from the vaccine. While a tiny amount of the virus is used to make the shot, it cannot generate an active infection within your body. You will probably be sore where you get the shot, but that is simply your immune system making protective antibodies to fight off the real influenza virus. In the fall, when the newest flu vaccine becomes available, lots of other viruses begin circulating. If you feel sick after getting the shot, it is likely that you were already going to get ill before you received the vaccination. Some people think that if they didn’t get their flu shot in the fall, then it’s too late. 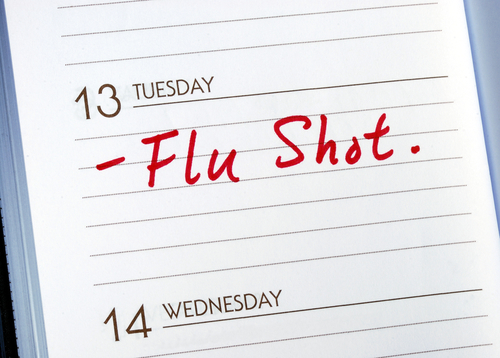 Since the flu season runs through May, the shot can still be useful – even in the spring. To protect yourself more fully, though, it’s best to get the new vaccine every fall as soon as it comes out. Just because you may have received the flu shot a few years ago, there’s no immunity built up in your system against the virus. The vaccine is altered every year to keep up with the three most prominent – and dangerous – strains of influenza. Therefore, every year you need to get a shot to protect yourself from the latest strains of the virus. A flu shot can make your life – and the lives of your loved ones – a whole lot easier. With a brief needle stick (or in some cases, a nasal spray) you can be protected from an illness that’s not only miserable, but dangerous. Take the possibility of a springtime flu off the table. Besides, aren’t allergies bad enough?